Whether you are going to the beach, going to the pool, or just playing around in the sprinklers, your little one is gonna need a swimsuit this summer. At Clementine, we have a variety of sizes and styles to choose from. We even have a few for the moms-to-be! 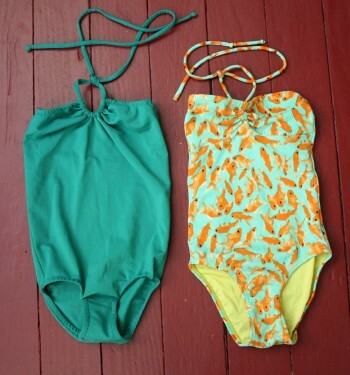 Middle: Both swimsuits by Le Petit Swim. Striped shorts, size 6mo. Plain black shorts, size 24mo. $17.99 each. Bottom: Both swim pants by iPlay. Both size 6mos. $12.99 each. Swim trunks by Lilly Pultizer. Black & White Maternity Bikinis!